Taekwondo as a martial art that is widely popular with people of many walks of life; young and old, man and woman, the physically fit and those looking to get back into shape. Physically, Taekwondo develops strength, speed, balance, flexibility, and stamina. The union of mental and physical discipline is the breaking of wooden boards, bricks or tiles, which requires both physical mastery of the technique and the concentration to focus one’s power. This is a great opportunity to be a part of such a great sport in the world. You can participate in tournaments or competition of higher level to represent yourself, your state, and even your country. Our instructors will help you achieve those goals. 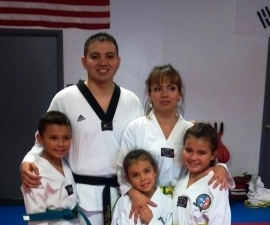 In the summer of 2013, a student from our studio became sub-world Taekwondo champion, proudly representing the United States, the state of Utah, and our academy in international competition.